I'm one of those people that likes to stay at home. You know, an introvert. I prefer to do things I know and talk to people I've known forever. Stepping out of my comfort zone isn't easy but I know it's necessary to have a fulfilling life. So when my online friend, Amanda, mentioned organizing a sewing retreat, I was all-in immediately. 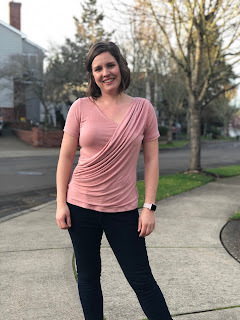 A bit of background... Amanda is the owner of Mily Mae Fabrics based out of her home in Vancouver, Washington. She's about an hour north of me. I've been ordering fabric from her for over a year and am a moderator in her Facebook fabric group. That being said, I hadn't met her in person until a couple months ago. You know when you meet someone and it just clicks? That's what happened with Amanda, her best friend Katie and myself. When she brought up a sewing retreat, I honestly didn't hesitate to sign up as I knew we'd have a great time. We decided to keep the group small for our first retreat. I'm personally glad we did. We ended up with 5 adults and a baby. This gave us an idea of how much space we'd take up, how to coordinate and just learn from this experience. Plus I really believe less people causes less drama. We were able to create friendships in person with each person rather than only interacting with a couple people in a larger group. We looked on AirBNB to find the perfect home to rent. We were looking between Portland and Vancouver, to keep it close to all of us but could also accommodate our specific set-up. Our goal was to find a house with plenty of natural light, a large sturdy dining table, open floor space and no clutter. We preferred 4+ bedrooms but were willing to share rooms or bring air mattresses as needed. We found a house that wasn't far from Amanda in Vancouver that she booked. Little did we know the bathroom of that house would flood the day we were set to check-in. She got a call at 4pm that day (yes, after the check-in time) to let us know they wouldn't be able to accommodate us anymore. After a scramble to find a house the same day, we landed on the beauty we stayed in SE Portland. In the end, it was probably an even better house than we could have imagined. I've since created a checklist of supplies to bring to a sewing meet-up or retreat. We had 4 women bringing supplies plus one woman flying in from Texas. We needed everything from tracing paper and patterns to hem gauges and irons. The thing I did learn was, bring extra fabric! Our set-up ended up with 3 sewing machines, 4 sergers and 2 cover stitch machines. One aspect about a sewing meet-up that was interesting was discussing and trying different sewing products. Each person had their preferred cutting device or mat, tools and even techniques. Here's some of the preferred items that we all loved. My husband bought me this Panasonic cordless Iron last year for Christmas and everyone loved it. It has a quick auto-off but heats up quickly too. Plus it's reversible, cordless and not heavy. Amy brought Medical Tracing Paper that was a crepe texture to it and worked great for tracing patterns. It seems significantly less expensive especially if you do the S&S there's a 50% off coupon right now. We also tried each others thread snips and they were definitely not created equal. I think we all preferred these Gingher one's although they take a moment to figure out how to hold them, they make snipping threads go quickly. We created a Facebook group before the retreat and discussed the patterns we planned to make. Did we end up doing what we discussed? No. Did we stick with a general plan? Yes. Our original plan was for joggers, a tee shirt and a hoodie. We all ended up making joggers but there were different patterns used based on each persons preference. For the tee shirt, we did all make the Patterns for Pirates Basic Tee. No one made a hoodie. What's interesting though is that for the most part, this was all made and completed the first day, if not the first morning. Then we realized we were in trouble as we didn't have enough supplies and headed to Amanda's shop to pickout more fabrics. For the next retreat my plan will be to bring all of my started projects. Also, I'll bring projects I'd been putting off that I felt were too difficult or beyond my skill level. Having others to help talk through the process made the sewing process seem so much simpler. I ended up sewing Saturday from 10-4pm then 8pm-1am and Sunday 9am-6pm for a total of 20 hours with breaks, baby holding and a lot of talking in between. During that time I was able to complete 8 items. I'll go into more details on those items/projects in another post. Next time I will plan out meals. We ended up hangry after forgetting to eat meals because we were consumed by our sewing. That seems like an easy fix in the future. I will plan a minimum of 10 projects next time and quite honestly, probably more. I like to be able to pick what I feel like sewing at the time. Prewash as much fabric as possible. Washing takes a minimum of 2 hours to wait on projects. Keep the group small. There's less drama and less to coordinate that way. The friendships that were forged went so much beyond what could be established communicating online. It was empowering to be around a group of individuals that share the same hobby. We all stepped out of our comfort zones and learned so much. We also laughed a ton! Be prepared to have a sewing hangover and come home exhausted. It's worth it. My posts may feature affiliate links. This means if you make a purchase from these links, I receive a small percentage in compensation at no cost to you. I may have received patterns or products to test or review but the opinions I voice are my own. Also, the majority of the photos in the post are not mine and being shared with approval from my friends. I only took one photo all weekend.